We've been back for a month and this is the first time I have a few minutes to sit down and write you an email with some feedback regarding our memorable wedding in Italy. Please feel free to share this email with future brides and grooms. I have also attached a few pictures to show you some of the highlights! Shortly after our engagement, Réjean and I decided we would get married in Italy and decided Tuscany would be the right place for us. Once we made that decision we set out to find a wedding planner. 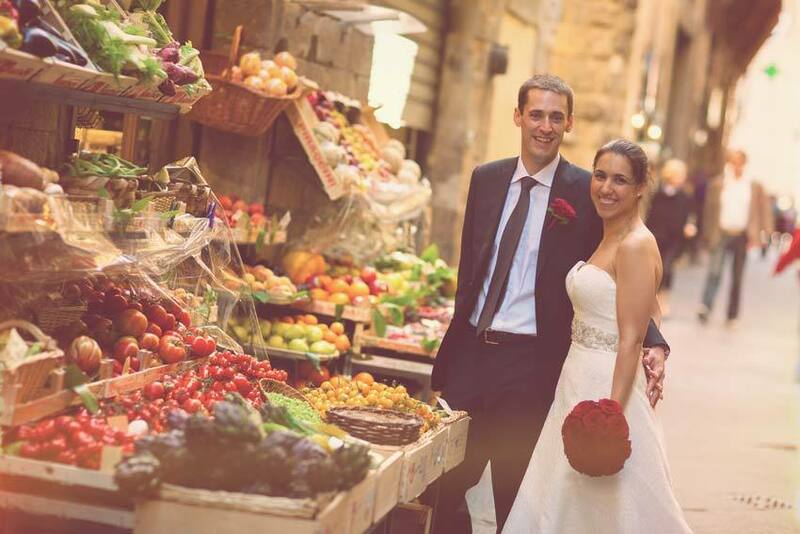 Googleing "Italy Tuscany Wedding Planner" we obtained a large amount of choices. We contacted fifteen planners who made the best first impression based on their websites. Immediately, from the first contact we had with Martina, we had a great feeling. In order to give us an idea of prices, she needed to get to know us. She was the only planner who actually asked those types of questions. Martina completely understood the type of setting and atmosphere we were looking for. In the initial stages of planning, the stress of sending funds across the ocean was an incredibly stressful. I always imagine the worst case scenarios! I would be lying if I said I didn't lose sleep everytime I sent funds to Italy. However, with the services provided by Exclusive Italy Weddings... I should have been sleeping like a baby! To any hesitating brides, put your fears aside... you will not regret it! Martina helped us find the most amazing lodging: Villa Tenuta Tornia! We planned a small wedding with our parents and siblings in attendance. The vision we had was to rent a villa or farmhouse for one week for us and all our guests. Martina put us in touch with an exclusive rental agency who offered great services. We were beyond delighted! The villa was grand, clean and beyond our expectations. Each room had an onsuite bathroom... what more could our guests ask for!! Our guests are still talking about the wonderfull villa... To be truthful, the accomodations for the rest of our trip in Italy simply did not compare to Tenuta Tornia. The ceremony left us speechless. The reason we opted for a civil wedding in Italy is partly because of the boring civil ceremonies in Canada. Our guests all mentioned the civil ceremony at the Palazzo Vecchio in the Sala Rossa felt much like a religious ceremony. It was a grand room and the words spoken by the officiant touched us very much. The violin was a very nice added touch! The violinist was discreet and professional. Leonardo, the chef, presented us with some amazing food! He and his staff were very attentionate. His staff were discreet and friendly. The aperitif was simply delightful. If we only had the aperitif all guests would have been delighted! Following the aperitif we had an amazing rustic tuscan dinner. The portions were perfect and each dish had nice presentation. The table set up was exactly as I had imagined... and the cake was delicious! We definetly do not regret having two desserts on our wedding day! We received the pictures and are delighted. The photographer was truly an artist. Réjean and I never take good pictures... but somehow... our wedding photos came out great! Walking in the streets of Florence minutes after our wedding was an amazing feeling... we were floating on a cloud of happiness. Thank you for the wonderful memories. Italy will hold a special place in our hearts for many years to come!